ALAMEDA – Baylor Nihei Fredrickson, a 7-year-old boy who lives in Albany, is going through what few of us can even imagine. In February 2012, Baylor or “Bay,” as his family and classmates call him, was diagnosed with acute myelogenous leukemia (AML). He was able to obtain remission after several rounds of chemotherapy. Unfortunately, Bay has relapsed. Bay is of mixed heritage – Japanese and German. A marrow transplant is his only hope for his long-term survival. 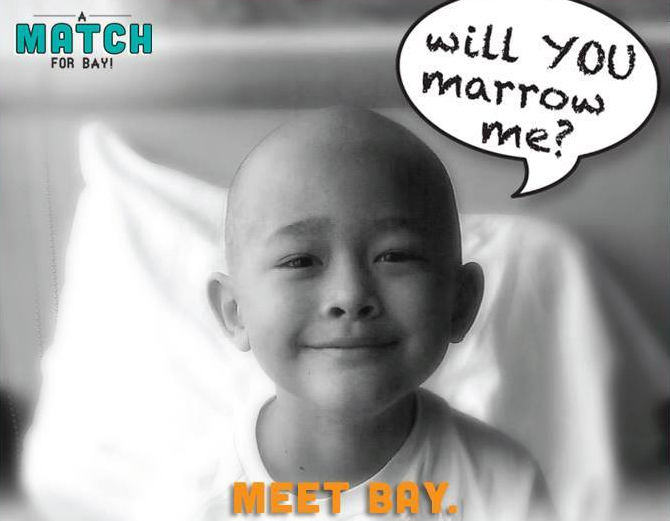 A marrow matching donor must be located before any transplant takes place. Baylor’s greatest chance of finding a marrow donor is from someone who is also part Asian and Caucasian. Unfortunately, no one from his immediate family is a marrow match. Only 30 percent of the time can a searching patient find a match from one of his or her siblings. AML is a disease of the bone marrow that is characterized by the rapid growth of abnormal white blood cells that interfere with the production of normal blood cells. These abnormal cells crowd out the normal red blood cells, white blood cells and platelets the body needs. Those who are not Caucasians are more likely to die of leukemia or of other blood cancers. This is because there is a shortage of ethnic donors on the national Registry. What’s the solution? Encouraging more people of mixed heritage, especially Asian and Caucasian heritage, to join the registry and potentially save a life. The Asian American Donor Program is a 24-year-old nonprofit organization, based in Alameda, that works to educate community members about the shortage of ethnic marrow donors and the importance of joining the registry. It is the oldest nonprofit of its kind in the country. According to Carol Gillespie, AADP executive director, there is a shortage of non-Caucasians on the Be The Match national registry. “We need everyone of mixed-race ancestry to step forward and join the marrow registry,” Gillespie says. “When a marrow match is not readily available, patients have to wait longer than is ideal to find a match.” When a patient must wait, his/her body becomes weak and may reject a transplant, once a marrow match is found. The younger of two siblings, Bay loves basketball. He plays the center or forward position on the Diablos, a team of the East Bay Athletic Youth Athletic League (EBAYL). He played basketball two weeks ago, just before he relapsed. Bay also played baseball for the Albany Little League, where he played rookie ball on the Mudcats. He also loves math, Greek mythology and watching children’s comedies. His favorite movies are “Meatballs” and “Percy Jackson.” The one thing that he cannot stand is the taste and smell of fish. He is full of life and positive energy. • Go to an upcoming drive and do a cheek swab to join the national registry. • Find out about other drives that you can attend or have a home kit mailed to you. Go to www.aadp.org/. • Contact friends and family and encourage them to go to a registration drive or register using a home kit. • Set up a drive in your area by calling AADP at 1-800-593-6667. • Volunteer to help at registration drives or in the AADP office. • Saturday, May 24, from 11 a.m. to 3 p.m. at the Sonoma Matsuri Japanese Arts Festival, Julliard Park, 227 Santa Rosa Ave., Santa Rosa. • Sunday, May 25, from 12 to 3 p.m. at the Berkeley Methodist United Church Bazaar, 1710 Carleton St., Berkeley.